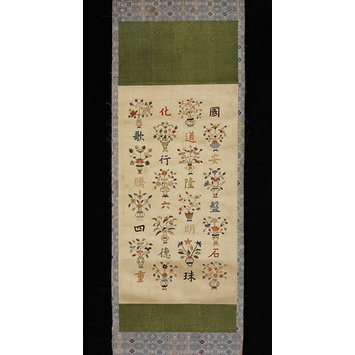 One of four mounted panels from an embroidered screen of the Kilsangdo (auspicious images) type. Coloured silks on a cream-coloured background with characters alternating with stylised floral arragements. Purchased. Registered File number 1991/1823. Embroidered screens of this type adorned the living quarters of queens and princesses in the late Chosôn period in Seoul. 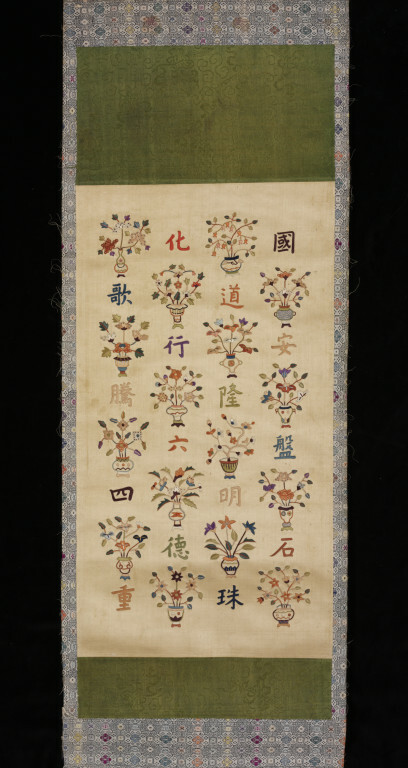 Executed by the court governess in charge of embroidery, the multi-coloured designs on each panel typically illustrate a four-line verse in Chinese characters of a song performed during court celebrations.